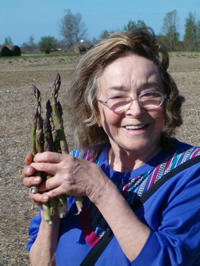 Bring along a plastic handled grocery bag for picking your own asparagus. You will be assigned a row. Stay in your row. Pick only and all stalks that are 5 inches tall or taller. Leave the shorter stalks to grow. Hold onto the stalk just slightly higher than ground level and give a quick snap. It will snap right where it is tender. No knives allowed or needed. You end up with fresh asparagus that is a great value to you. No wasted hard ends! Process asparagus, onion and garlic in blender or food processor until smooth. In bowl, combine remaining ingredients. Stir in the asparagus mixture until blended. Serve with assorted raw vegetables or baked tortilla chips. Refrigerate leftovers. Makes 2 cups. 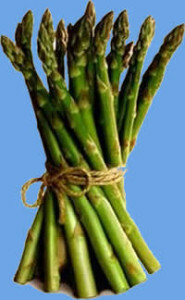 Cook asparagus in 1 cup water until tender-crisp. Combine crumbs and cheese and set aside. Combine soup, asparagus and asparagus liquid. In a casserole dish layer half of crumb/cheese mixture then top with half of asparagus/soup mixture. Repeat crumbs and asparagus layers. Top with almonds and melted butter. Bake at 350° for 30-35 minutes. Double recipe for larger casserole. YUM!!! For more great recipes, visit BerryLand today. Asparagus season usually starts the first or second week of May and then extends through much of June. Sautee leeks & onions in butter till tender. Add potatoes, carrots, salt, broth & rice. Cover & bring to boil; reduce heat & simmer 30 minutes. Stir in asparagus & simmer 10 minutes or until vegetables are tender. Add spinach, pepper & cream then heat through. A soup to remember! !